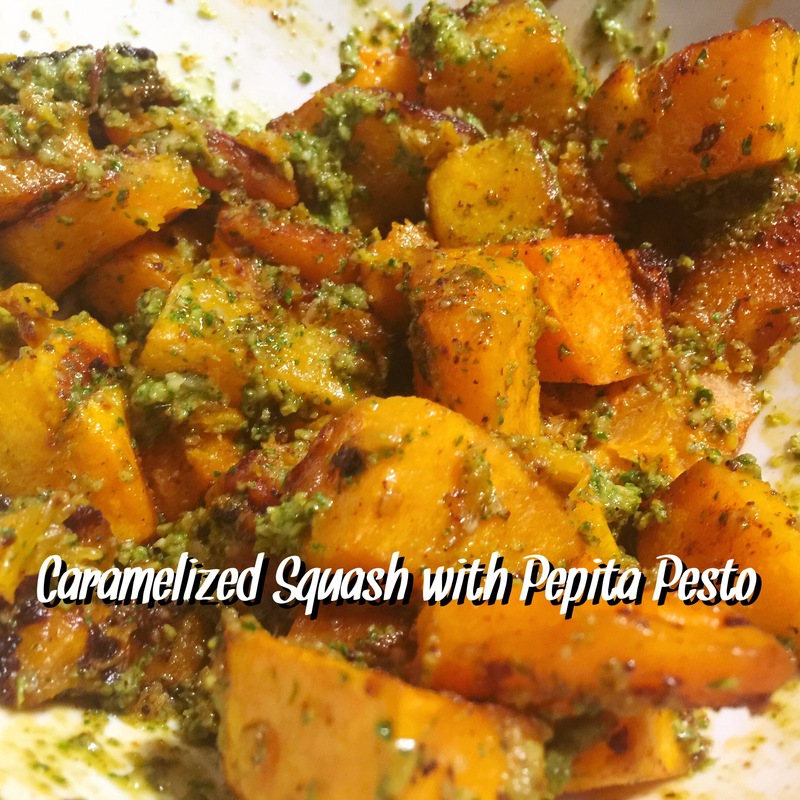 This was a big hit at a potluck – the pepita pesto was addictive, and I’m sorry to have only made the one squash — there was enough pesto for two, and enough demand for more. Preheat your oven to 375 and line a baking sheet with foil. 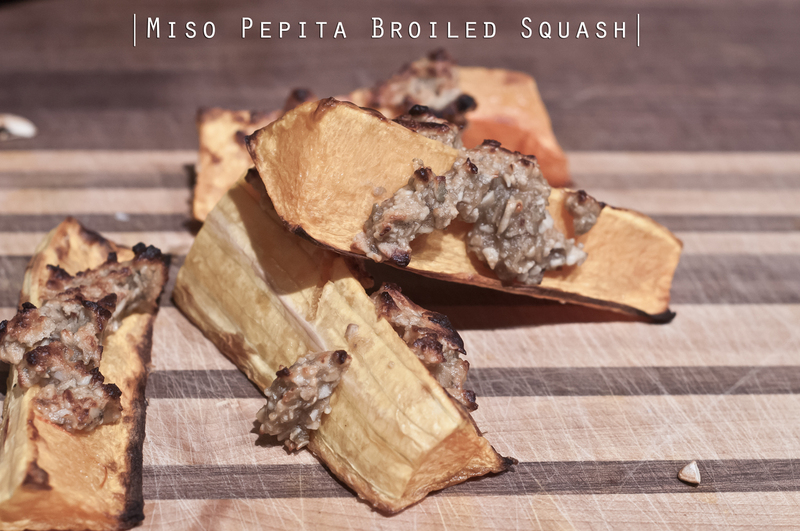 Prep your squash if not done already, and combine the rest of the ingredients in a small bowl. Pour over the squash and toss to combine. Bake for 20 minutes, or until the squash is soft and starts to brown. Blend all ingredients in the bowl of your food processor. If you find the pesto is too thick, add a little more oil. Toss the squash with the pesto to serve. As written, this recipe would make enough for 2 dinner portion sides – maybe 3; if you’re bringing somewhere, consider doubling the squash. I, dear friends, have been saddled with a squash nonbeliever. I did it to myself, really. I *knew* my DH harbored this character flaw way back when he was only ‘the boyfriend’, and chose to ignore it – to deal with this injustice later; to blindly turn my eye to the potential battleground that would become dinner and forge ahead. This squash distainer sits at my dinner table (who am I kidding? the couch) every night during the fall, hoping whatever huge wintery monstrosity made my eyes shiny at the grocery store/farmers’ market the weekend before is not making an appearance on his plate. And then it does, and the poor guy does what he can with it. Funky textures, sweetly savory tastes and all. This dish is an olive branch of sorts – a peace offering for the many, many hashes and roasted lumps of undesirables I make my longsuffering DH consume each year when the mercury dips below 50. For the broken promises of crispiness; the bait-and-switches that come when silky purees don’t have the expected flavor profile. Who doesn’t love bacon? And if you have to eat squash to get it, maybe that bacon fat-basted root veggie won’t be so bad. Preheat your oven to 400 F and line a cookie sheet with parchment paper. Now attack your squash. Peel with a vegetable peeler, lop off the ends and cut into half width-wise (you should have two big hunks of squash – 1 with seeds and 1 without). Cut your seedless half into half again and then into large fry looking wedges. Reserve the other half for another purpose (a nice hash, perhaps). Cut your bacon into half so you end up with 12 slices. 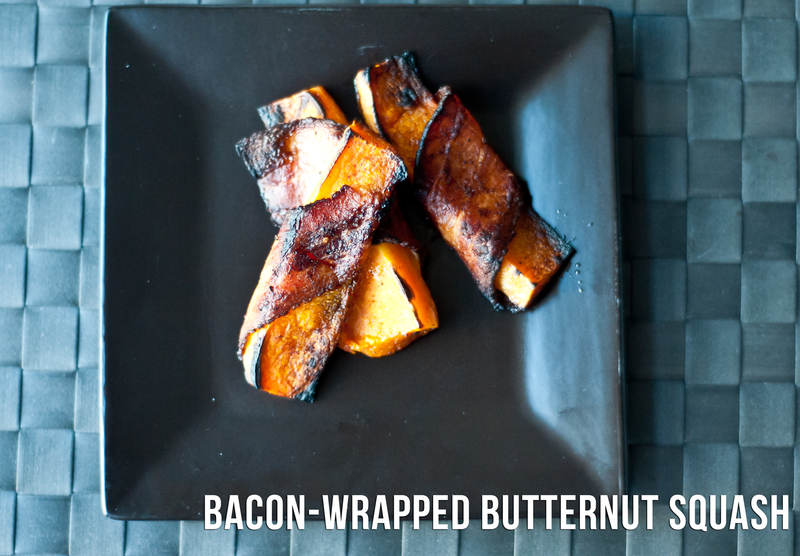 Wrap a slice of bacon per wedge – my large butternut yielded 12 good wedges; perfect for the amount of bacon I had on hand. When wrapping, make sure both ends wind up on the same side and put that side down on the prepared baking sheet. Sprinkle with chili powder, salt and pepper. Bake for 30 minutes (or until the squash is soft and the bacon is done), kick your broiler up to high, and broil 5 minutes on each side to finish crisping the bacon and brown the edges of the squash. This salad is sweet, tart, fatty & salty and strikes a great balance between the carbs & fat you want when the weather turns cold, and more virtuous things like fresh greens. Preheat your oven to 425 F. Line a cookie sheet with foil. Slice the ends off your squash and push the seeds out with a spoon. Slice into 1/4-inch rounds. Lay squash rounds in a single layer on your prepared sheet – making sure not to crowd; brush with olive oil and sprinkle with salt & pepper. Bake 20 minutes, flip, and bake another 20 minutes or until browned and nutty on both sides. While the squash is working, de-seed your pomegranate (my favorite method is to roll the pomegranate on a cutting board to loosen the seeds, cut in half, and whack with the back of a wooden spoon. Not only cathartic, this method is really quick and only a little splattery). Reheat your pork (I prefer crisping it up a bit either under the broiler or in a pan on the stovetop) and gather the rest of your ingredients. 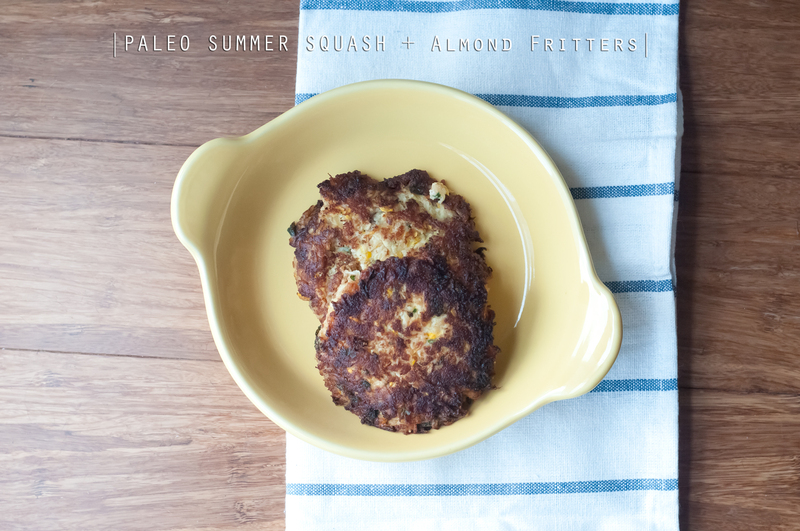 When the squash is crisped, pull from the oven and start assembling your salad. 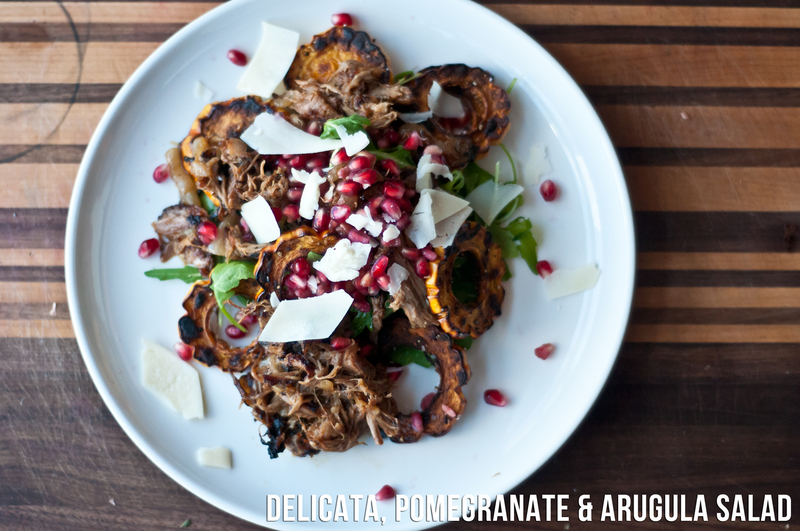 I used about a cup of arugula, 6-8 slices of squash, a hand full of pomegranate arils, a Tablespoon or so of cheese, and a drizzle of pomegranate molasses. Enjoy. Depending upon the size of your squash, serves 2-4. My squash was on the small side and I was hungry, so it served 2.